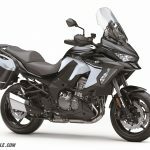 For 2019, Kawasaki has updated its largest Versys to bring in a new look and modernized electronics. The 2019 Kawasaki Versys 1000 SE LT+ takes the same 1,043 cc inline-Four that we’ve loved for all these years and updates it with a new electronics package. First, the new Electronic Throttle Valves mean that the Versys 1000 is now a ride-by-wire machine with all the benefits associated with that change. 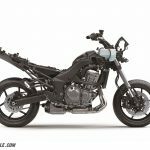 Kawasaki claims that the new ECU-controlled butterfly valves deliver “smooth, natural engine response and the ideal engine output.” Additionally, the switch to R-b-W means that Kawasaki Quick Shifter (KQS) has made its way into the parts manifest, giving smooth, clutchless up- and down-shifts. The clutch itself is an assist and slipper unit for easy use. 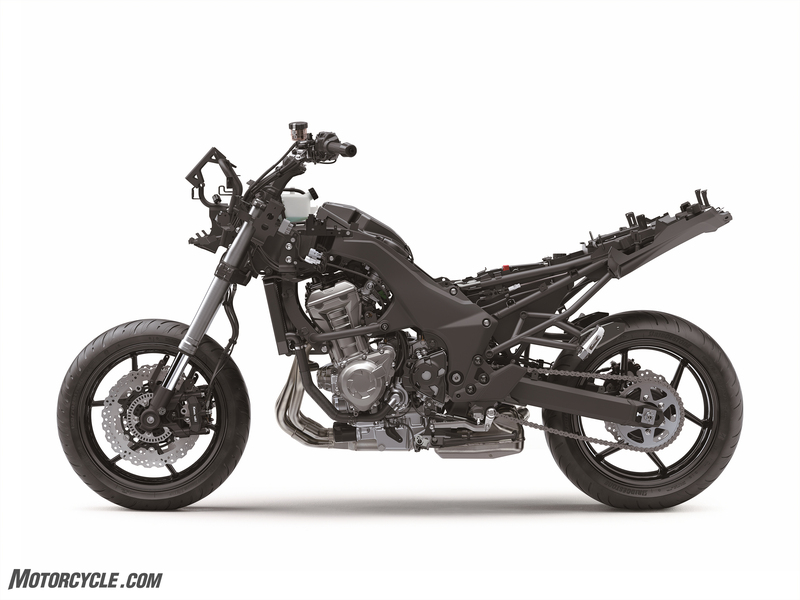 While the chassis remains the same, the suspenders it wears went for a trip to the future and gained Kawasaki Electronically Controlled Suspension (KECS) technology. Now, based on the rider’s selection of four modes (Sport, Road, Rain, and Rider mode (Manual)), the KECS automatically adjusts to the road surface in real time. This means that, every 10 milliseconds, the KECS ECU is receiving information from suspension sensors, the IMU, and the ECU about the status of the motorcycle and making changes to the solenoid-activated suspension damping. All of this should increase rider confidence over a variety of road conditions. Naturally, since the 1000 SE LT+ has an IMU, the brakes receive KIBS (Kawasaki Intelligent anti-lock Brake System). 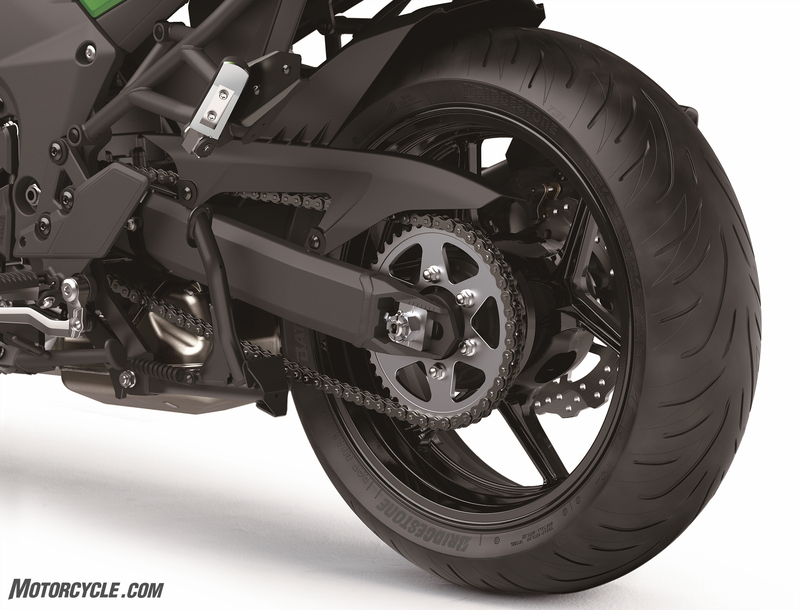 Developed on bikes like the Ninja ZX-10R and Ninja H2 and modified for street riding on a long-travel suspension, KIBS modulates the brakes based on lean angle and other factors. Rider ergonomics were also updated with a new, taller windscreen that can be adjusted from the saddle via two knobs. The screen shape and venting reduce the back pressure on the rider while limiting the turbulence at speed. The rider triangle is relaxed for all day riding. When that riding day is over, you can carry 28 liters of gear into your hotel in the standard hard luggage. The fairing was updated for 2019 giving the Versys more aggressive appearance. Also, the cool cornering lights first seen in the Ninja H2 SX SE make the scene and light up the inside of corners when riding at night. Aside from the cornering lights, the LED headlight should throw a brighter pattern down the road. 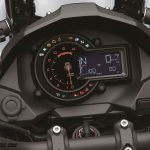 Another new item is the TFT instrumentation, which gives the rider a choice of two view modes plus many of the display options you’d want in a travel-focused motorcycle. Also, Kawasaki has added smartphone connectivity in the form of the Rideology App. Now, riders can check vehicle information, update a ride log, and make tuning adjustments right from their phone. We’re looking forward to seeing the Versys 1000 SE LT+ next year for $17,999. Read Kawasaki’s press release below. Kawasaki is a company that is synonymous with versatility, innovation, and the pursuit of absolute performance, and nothing embodies this philosophy more than the all-new 2019 Versys® 1000 SE LT+. It is the most versatile adventure-style motorcycle Kawasaki has ever made; it is ready for any road, any time. For 2019, the all-new Kawasaki Versys SE LT+ features a 1,043cc in-line four cylinder power plant, utilizing the latest technology in engine tuning and design, as well as a high-performance chassis and a full suite of state of the art advanced rider support features. What makes the Versys 1000 SE LT+ one of the most versatile motorcycles for riding solo or two-up, around the corner or around the globe, is the combination of a smooth and responsive in-line four engine tuned for flexibility, and a nimble chassis fitted with dynamic Kawasaki Electronic Controlled Suspension (KECS) that will leave riders with smiles for miles. Developed to suit a wide range of riders, the Versys 1000 SE LT+ platform provides riders a motorcycle that allows for Good Times™ to be had across a wide variety of street riding scenarios. The Versys 1000 SE LT+ features several all-new performance-increasing updates to the engine, suspension, and ergonomics, as well as increased long-ride comfort and advanced rider support technology. Complementing the increased performance and handling advancements is all new, fresh, and unique Versys® styling, which showcases the balance of aesthetic appeal and functional design. The Versys 1000 SE LT+ motorcycle is packed with premium class leading components and technology, such as Electronic Throttle Valves (ETV), Kawasaki Electronic Controlled Suspension (KECS) Showa front fork, and Kawasaki Cornering Management Function (KCMF) along with much more. The Versys 1000 SE LT+ features a powerful but playful liquid-cooled, DOHC, 16-valve 1,043cc in-line four engine, with a bore and stroke of 77.0 x 56.0 mm, which creates strong low-mid range torque and facilitates smooth power delivery. The engine has been tuned for flexibility and offers superb throttle response, strong torque throughout the rpm range. Electronic Throttle Valves (ETV) complement the engine performance and design for 2019. Other new features for 2019 include new fuel injection mapping, exhaust design, and a new catalytic converter design. The all-new Electronic Throttle Valves enable the ECU to control the volume of both the fuel and the air that are delivered to the engine, by way of the fuel injectors and throttle valves. The optimal fuel and air inputs create a smooth, natural engine response and the ideal engine output. The ETV system has the accelerator position sensor located in the throttle assembly, eliminating the throttle cable. The Versys 1000 SE LT+ utilizes gear ratios that were chosen to accommodate a wide range of riding situations, including sport riding, highway cruising or riding fully loaded with a passenger and luggage. 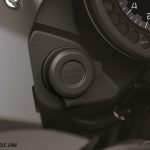 New for 2019 on the Versys 1000 SE LT+ motorcycle is a contactless-type quick shifter that allows for ultra quick, full power upshifts and clutchless downshifts. 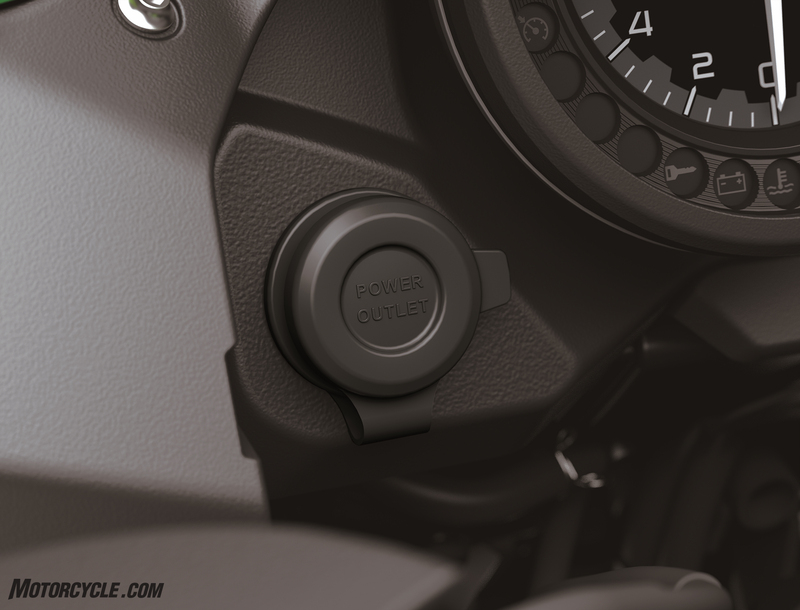 The Kawasaki Quick Shifter (KQS) detects that the shift lever has been actuated, and sends a signal to the ECU to cut ignition so that the next gear can be engaged for clutchless shifting. During deceleration, the KQS system controls engine speed to perfectly match engine RPM, which smoothly engages the lower gear, allowing effortless downshifts. Complementing the transmission is an assist & slipper clutch, race-inspired technology that offers both a back-torque limiting function as well as a light feel at the lever. The slipper function is noticed when excessive engine braking occurs as a result of quick or accidental downshifts. The slipper cam comes into play, forcing the clutch hub and operating plate apart, which relieves pressure on the clutch plates to reduce back-torque and help prevent the rear tire from hopping and skidding. 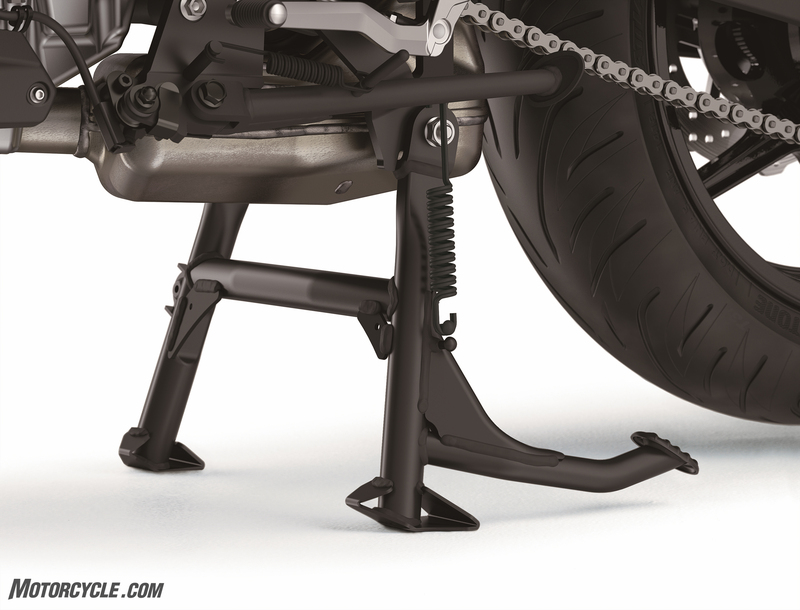 The frame of the Versys 1000 SE LT+ is composed of a five-piece cast aluminum construction, consisting of steering stem, left and right main frames, and two cross pieces. The two main sections of frame components have open C-shaped cross sections and were die-cast to ensure a smooth surface finish. The lightweight, highly rigid frame uses the engine as a stressed member, which contributes to handling, offering a firm, planted feeling and light, nimble turning. The sub-frame is composed of a steel tube trellis design, which enables the high-payload. To create the sleek appearance, the frame was constructed with the fewest amount of welds possible. 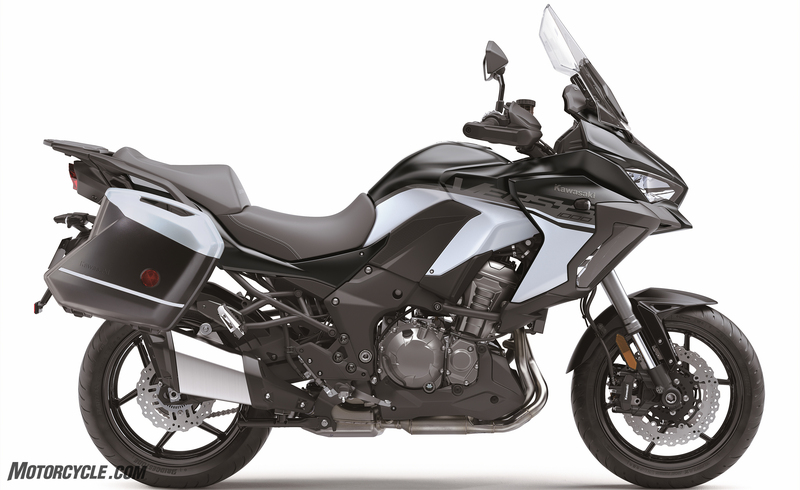 The Versys 1000 SE LT+ motorcycle is equipped with 150 mm of long travel suspension, both front and rear. 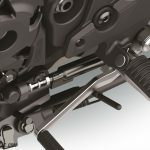 The 43 mm Showa cartridge fork and Showa BFRC lite rear shockutilize the latest in Kawasaki Electronically Controlled Suspension technology (KECS). Compression and rebound damping for both the forks and shock are generated (and adjusted) electronically via the all-new KECS system that is controlled by a solenoid valve with direct actuation and allows for extremely quick reaction time. 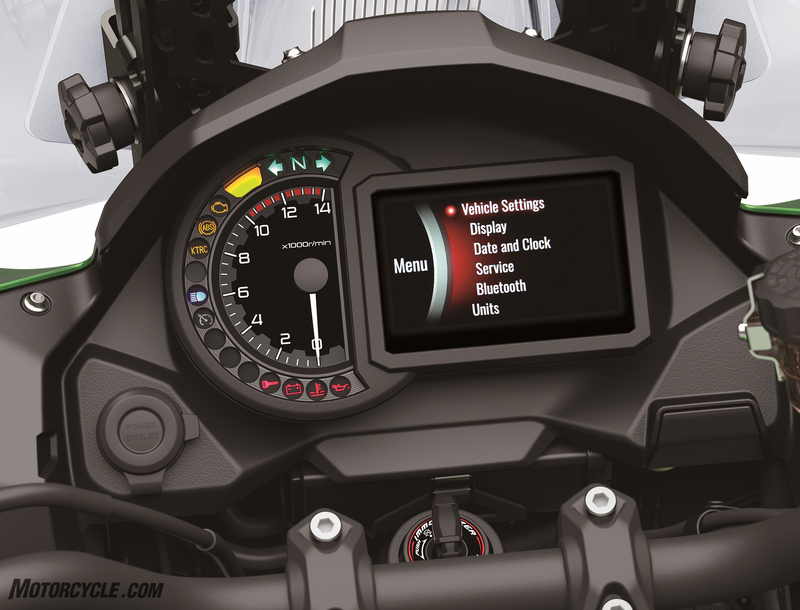 Riders can choose base settings from four modes: Sport, Road, Rain, and Rider mode (Manual). KECS then adjusts to the road surface environment in real time to provide the ideal damping, taking into account vehicle speed, and stroke speed. Deceleration is also accounted for to manage the natural pitching that occurs under braking. 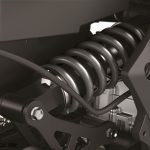 Riders can now electronically control the rear shock preload settings as well. KECS offers three different preload settings: rider only, rider with luggage, and rider with passenger and luggage; riders can fine-tune these settings with 10 levels of adjustment. The forks and shock have built-in stroke sensors that provide real-time stroke speed and compression information. The sensor coils provide input to the KECS ECU every millisecond. This is complemented by information provided by the IMU (acceleration/deceleration) every 10 milliseconds, and the FI ECU (vehicle speed) every 10 milliseconds. The KECS ECU then directs current to the solenoids to adjust damping as required by the situation. This results in quick reaction time to road conditions and maintains a natural feeling that is crucial to the ride feeling at one with the motorcycle. The KECS, coupled with a Showa 43 mm inverted cartridge fork and BFRC lite suspension components, delivers added confidence in rough road conditions and assures the tires feel planted when cornering. 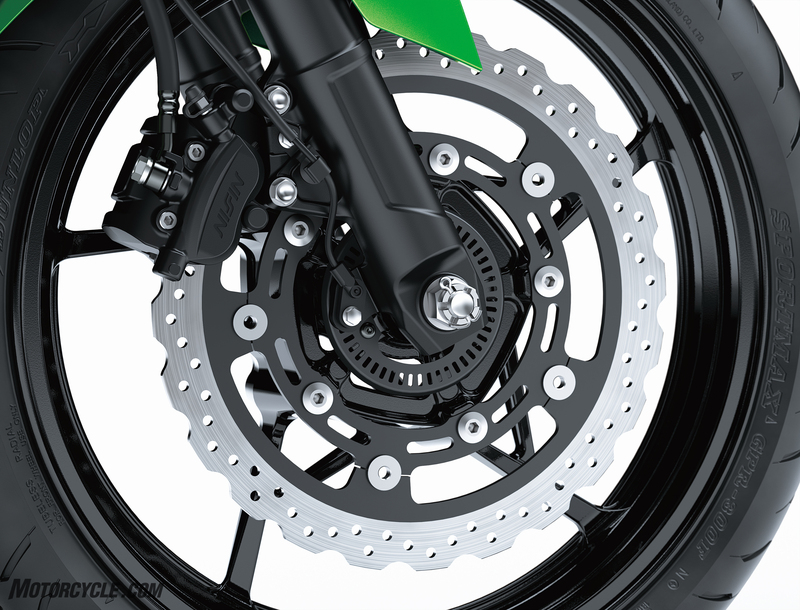 The Versys 1000 SE LT+ comes equipped with sporty, lightweight six spoke 17 inch wheels front and rear. For a bike with unlimited street riding potential, it was crucial to find tires that offer superb cornering performance for more fun in hills, great high-speed stability, and a strong on-road image to go with the sporty character. Handling the stopping duties for the all-new Versys 1000 SE LT+ is a full disc brake setup, featuring Kawasaki’s Intelligent anti-lock Brake System (KIBS) technology. The Radial-pump front brake master cylinder commands a pair of 4-piston radial-mount monobloc calipers to grip a pair of 310 mm brake discs, providing plenty of stopping power. The rear brake features a single piston, pin-slide caliper gripping a 250 mm disc. Kawasaki’s supersport-grade ABS is standard equipment on the Versys 1000 SE LT+ motorcycle. This is based on the same system used on the Ninja® ZX™-10R and Ninja H2™ sportbikes, with programming and settings revised to suit both the street performance parameters and long-travel suspension of the Versys 1000 SE LT+. High-precision brake pressure control enables the system to avoid reduced brake performance due to excessive pressure drops, allowing lever feel to be maintained when KIBS is active, and helps ensure ABS pulses feel smooth. 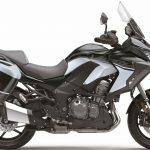 For 2019, the Versys 1000 SE LT+ received several ergonomic features to enhance performance and comfort. At the front of the motorcycle, a new adjustable windscreen, vent layout, and cowl design all aid increasing performance and comfort. 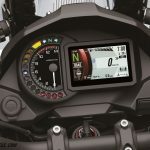 The new large windscreenheight can now be adjusted from the rider’s seat, without tools, using two knobs on the inside of the screen to suit the rider’s height preference. 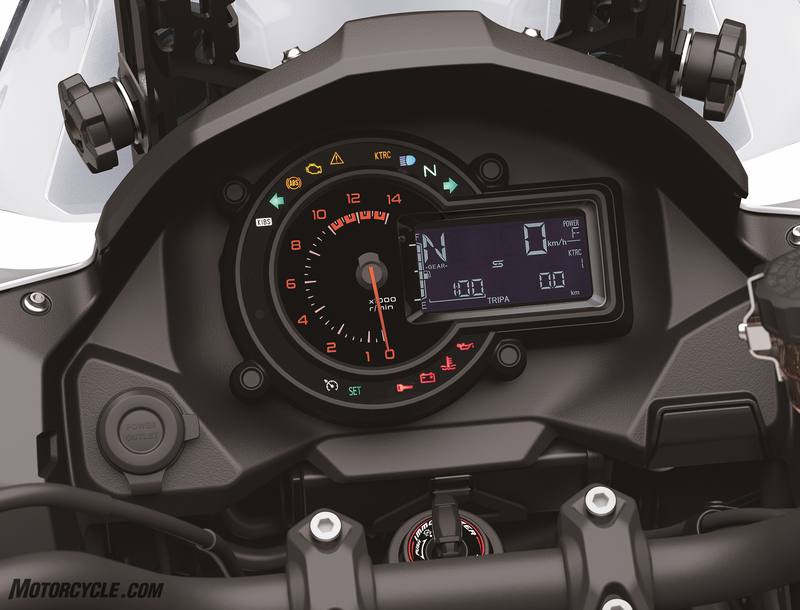 The adjustable windscreen is equipped with a centrally located vent, which helps reduce the negative-pressure effect in the cockpit, increasing rider comfort at high speeds. 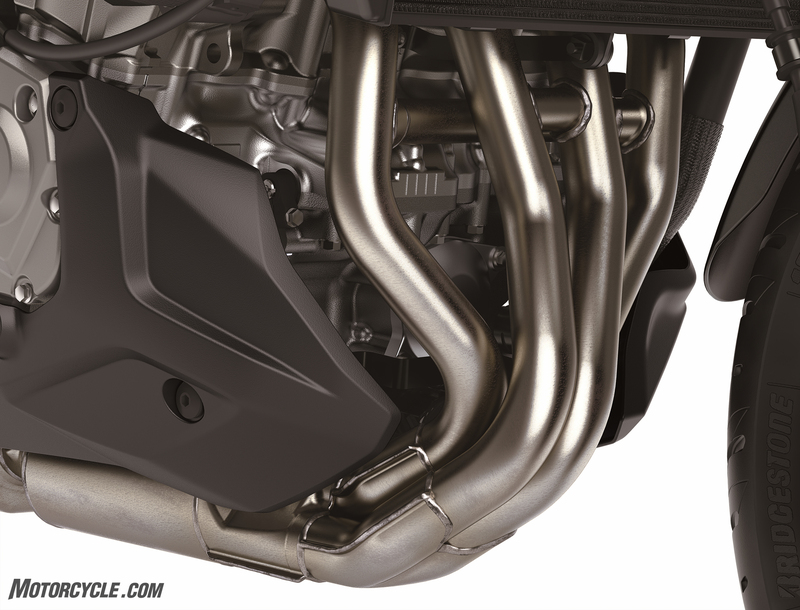 The new upper cowling design and wider fairing provide increased wind protection, while still keeping fresh air routed to the areas of the engine bay that produce the most heat. The wide handlebar and slim seat design along with low and forward footpeg position of the Versys 1000 SE LT+ creates a spacious and confidence-inspiring rider triangle.The upright riding position accommodates a variety of riding styles, broadening the spectrum of riding enjoyment and also offers a high level of comfort, a great benefit for longer rides. 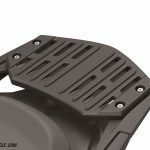 The saddlebag mounting system of the Versys 1000 SE LT+ motorcycle utilizes the Kawasaki Quick Release mechanism, which allows for convenient, easy removal and installation of the saddlebags. 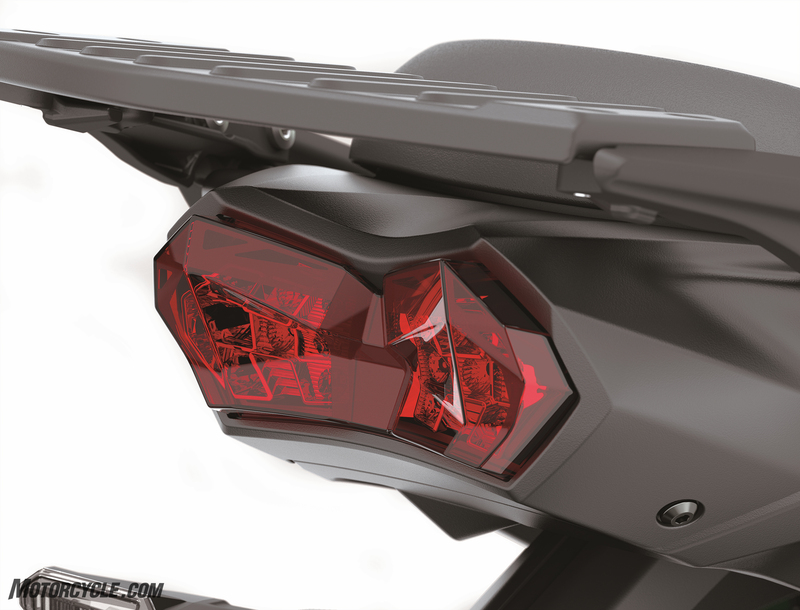 Seamlessly integrating the saddlebags with the rear of the bike, the clean-mount system positions them close to the centerline of the motorcycle and thanks to its clean, clutter-free design, ensures the rear of the bike still looks good with the saddlebags removed. The standard KQR™28 liter hard saddlebags are rated for up to 11 lbs storage weight and utilize the one-key system, which means they can be unlocked and removed with the ignition key. They are also color-matched to the body of the bike and have the Kawasaki logo stamped into their covers, ensuring a well-integrated, high-quality image. 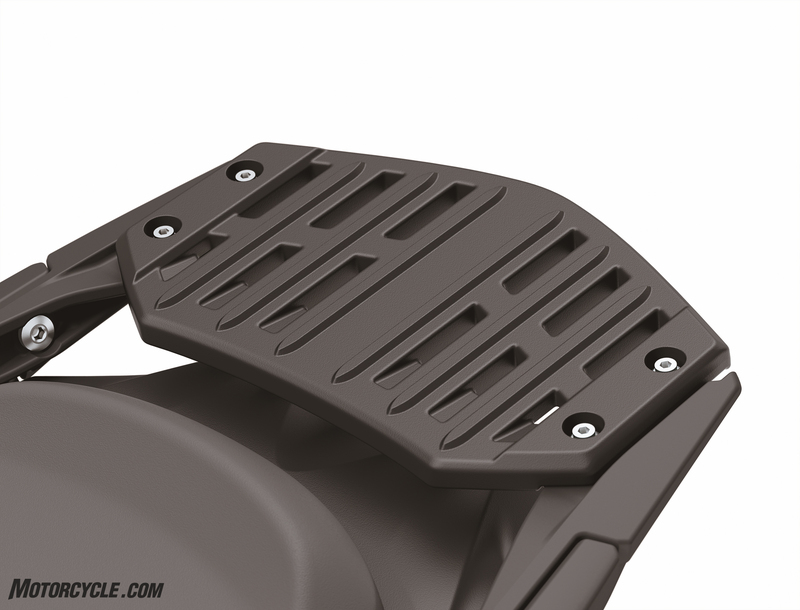 The Versys 1000 SE LT+ can also accommodate a top case with the saddlebags, offering multiple configuration options. As an adventure touring motorcycle, the construction of the Versys 1000 SE LT+ required the use a of robust steel tubing to provide the sub-frame with the substantial 485 lbs payload capacity for carrying a passenger and luggage. The styling and design of the Versys 1000 SE LT+ features smooth, flowing lines throughout the chassis and bodywork, Highly Durable Paint and full LED lighting which helps to create a motorcycle that is sure to keep even the most-seasoned riders enticed. 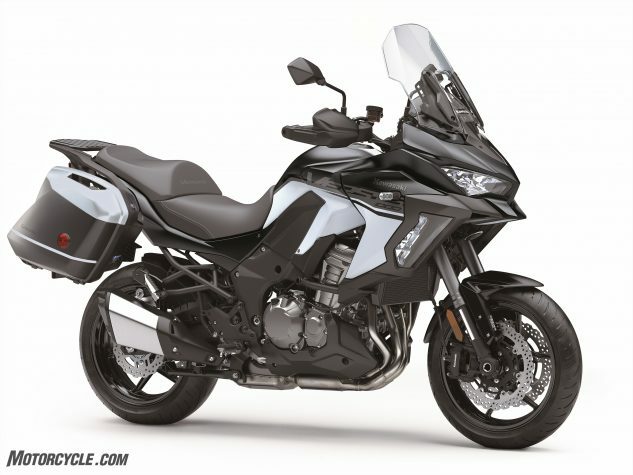 The new design of the Versys 1000 SE LT+ flows from the front of the bike to the rear. Its refreshed appearance of the front fairing and upper cowl signify the next step in the evolution of the Versys line of motorcycles. In the new design, the engine and sub-frame area were consciously presented as a styling element, as it showcases the trellis-style sub-frame. Also, in addition to the strategic use of colored pieces, the new design displays the balanced use of metal and composite materials, with each part’s material reflecting its functionality. A new front design with long, slim reflectors contributes to sporty looks while offering increased protection for the fork inner tubes. 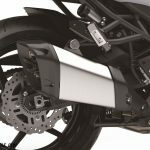 The new compact, sporty silencer showcases the sophisticated styling and image that has been added to the back of the bike. Kawasaki’s new Highly Durable Paint and Highly Durable Matte Paint was chosen for all high touch areas including the fuel tank, side cowls, and side covers on the Versys 1000 SE LT+. The Highly Durable Paint features a special coat that allows certain types of scratches to repair themselves, enabling the paint to maintain its high-quality finish. Soft and hard segments in the coat work together like a chemical spring, creating a trampoline effect that absorbs impacts. The Highly Durable Matte Paint is highly wear-resistant, enabling the paint’s beautiful matte finish to be maintained for years to come. Complementing the sleek and elegant appearance of the Versys 1000 SE LT+ is full LED lighting and cornering lights. Each of the new LED headlamps features low and high beams as well as a position lamp. The new headlamps offer significantly increased brightness.The LED cornering lights, which are built into the shrouds, help to illuminate the road when cornering. Each of the three lights has a fixed direction and is activated based on lean angle. As the bike leans over, the lights come on in order, creating a wider illuminated path in the direction the bike is heading. New instrumentation with an advanced, high-tech design gives the cockpit of the Versys 1000 SE LT+ a very high-class appearance and feel. The analogue-style tachometer is complemented by a high-grade full colorTFT LCD screen, which automatically adjusts screen brightness to suit available light. The screen enables information to be displayed graphically. 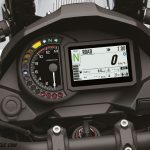 Two selectable display modes allow riders to prioritise the information they want to see depending on the kind of riding they are doing at the time. 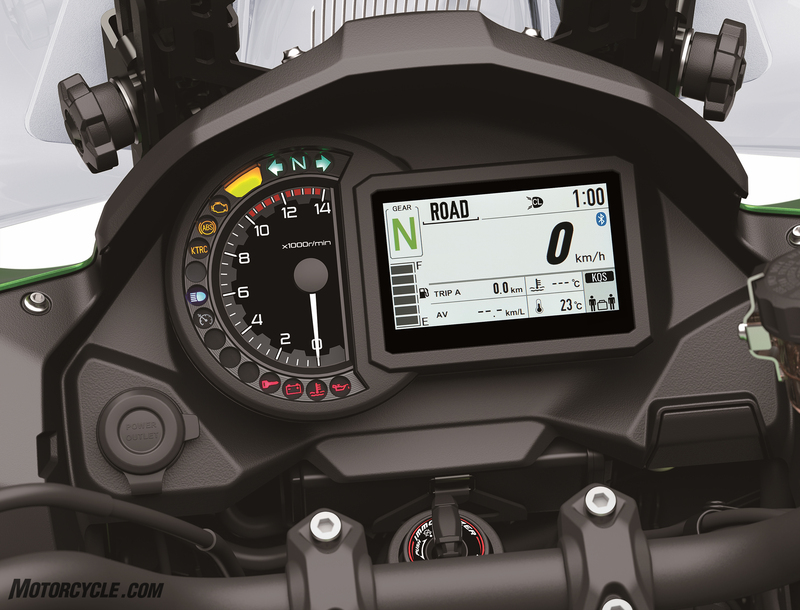 The first mode was designed with touring in mind; the easy-to-read, calm layout offers a substantial amount of information at a glance. The second mode was designed with sport riding in mind. Important information is prioritized and presented graphically for easy digestion: tracking information such as the G-forces through the feedback from the IMU, throttle and brake force application are illustrated visually rather than numerically. 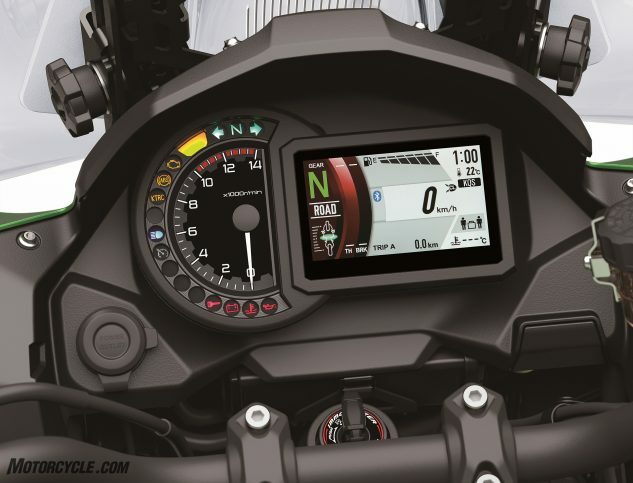 In addition to the digital speedometer and standard gear position indicator, display functions on the Versys 1000 SE LT+ motorcycle include: fuel gauge, odometer, dual trip meters, current and average fuel consumption, remaining range, coolant temperature, intake air temperature, clock, Economical Riding Indicator, integrated riding modes, IMU indicator and smart phone connectivity. 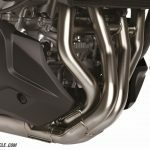 The strength of Kawasaki’s cutting-edge electronics has always been the highly sophisticated programming that, using minimal hardware, gives the ECU an accurate real-time picture of what the chassis is doing and what the rider wants, to best support the rider’s intentions with natural feel. Using the latest evolution of Kawasaki’s advanced modeling software including input from a compact Bosch IMU (Inertial Measurement Unit), Kawasaki Cornering Management Function (KCMF) monitors engine and chassis parameters throughout the corner to assist riders in tracing their intended line through the corner. The Versys 1000 SE LT+ utilizes the input from multiple sensors to optimize ride quality via the Kawasaki Electronic Controlled Suspension (KECS) and the Kawasaki Intelligent anti-lock Braking System (KIBS). 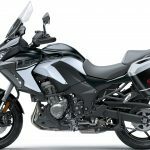 The use of the latest Bosch compact IMU is new for the Versys 1000 SE LT+ in 2019, and weighs in at only 40 grams. The IMU allows an additional layer of precision to be added to the already high-level components. The system uses minimal hardware but complex Kawasaki proprietary software. IMU enables inertia along six DOF (degrees of freedom) to be monitored. Acceleration along longitudinal, transverse and vertical axes, plus toll rate and pitch rate are measured. The sixth axis, yaw rate, is calculated by the ECU using Kawasaki original proprietary software developed through World Superbike racing experience. 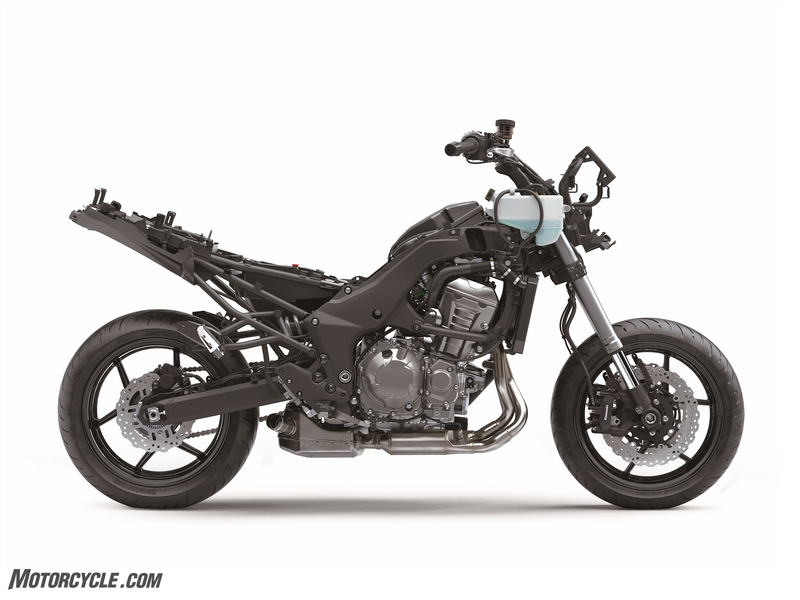 The motorcycle’s ECU gains an even clearer real-time picture of chassis orientation, and its software is uniquely predictive as it combines chassis orientation information with real time monitoring of the rider’s intentions to enable the control systems to maximize forward acceleration. The Versys 1000 SE LT+ motorcycle allows riders to choose from Full Power or Low Power modes, setting power delivery to suit preference and conditions. While output at lower rpm is very similar, Low Power mode limits output to approximately 75% of Full Power and uses a milder throttle response. Reduction in both power and throttle response varies according to engine speed, throttle position, and gear position. 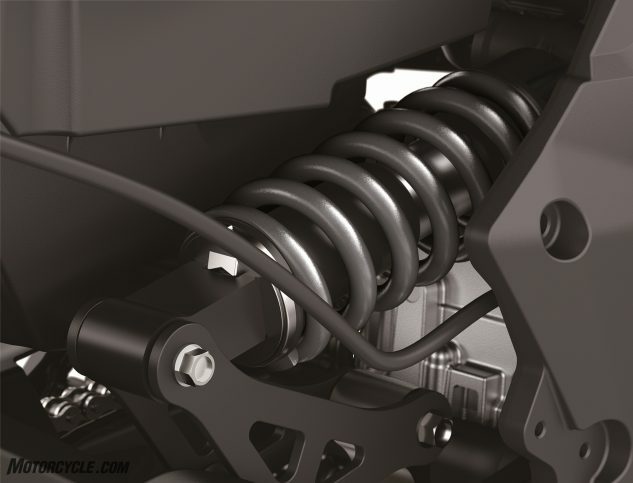 All-inclusive modes that link KTRC, Power Mode and KECS allow riders to efficiently set traction control, power delivery, and suspension characteristics to suit a given riding situation with a single adjustment. Riders can choose from four settings: Sport, Road, Rain or a Rider (Manual) setting. The Sport setting enables riders to enjoy sporty handling riding on winding roads. The Road setting provides comfortable riding characteristics over a wide range of situations, from city riding to highway cruising and rural roads. TheRain setting offers rider reassurance when riding on a low-traction surface. In the manual Rider mode, each of the systems can be customized. The Kawasaki TRaction Control (KTRC) featured on the Versys 1000 SE LT+ motorcycle has three modes for riders to choose from that enable optimal performance for a wide range of riding conditions, offering either enhanced sport riding performance or the peace of mind under certain conditions to negotiate a variety of surfaces with confidence. Kawasaki’s advanced modelling software, complemented by input from the IMU, delivers this one of a kind precise control. The system can also be turned off if riders elect to do so. The Versys 1000 SE LT+ is equipped with electronic cruise control, which improves the overall comfort for those long days on the road. 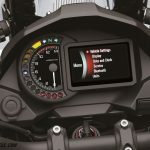 The new cruise control system enables riders to set and maintain their desired speed with the simple press of a button. Once activated, the rider does not have to constantly apply the throttle to maintain speed. The cruise control helps to reduce rider fatigue when traveling long distances, allowing the rider to relax and enjoy cruising, contributing to a high level of riding comfort. 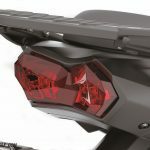 Kawasaki offers a full line of Kawasaki Genuine Accessories (KGA) including LED light bar, helmet lock, knee pad set, tank pad, front axel slider set, radiator trim, frame slider set, Ergo-Fit™reduced reach seat, GPS bracket, and KQR™top case. 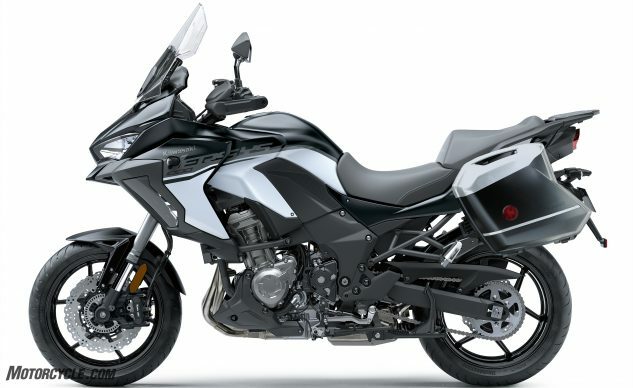 The 2019 Kawasaki Versys 1000 SE LT+ is available in Metallic Flat Spark Black / Pearl Flat Stardust White.